"We are witnessing a single recent accretion event where a medium-sized galaxy fell through the center of Messier 87, and as a consequence of the enormous gravitational tidal forces, its stars are now scattered over a region that is 100 times larger than the original galaxy!" said Ortwin Gerhard, head of the dynamics group at the Max-Planck-Institut für extraterrestrische Physik. 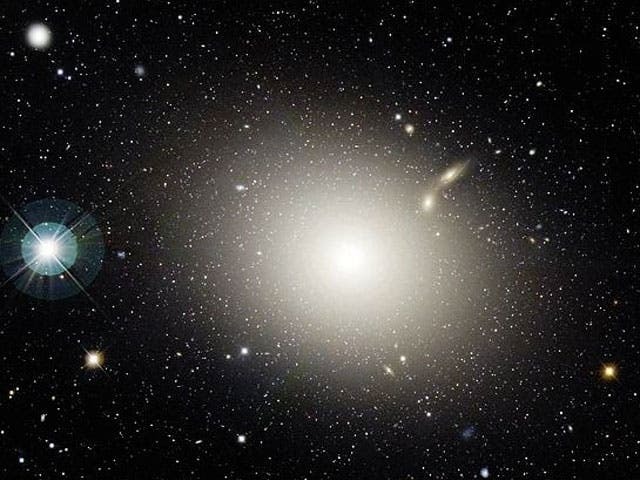 New observations this month with ESO’s Very Large Telescope have revealed that the giant elliptical galaxy Messier 87 has swallowed an entire medium-sized galaxy over the last billion years. For the first time a team of astronomers has been able to track the motions of 300 glowing planetary nebulae to find clear evidence of this event and also found evidence of excess light coming from the remains of the totally disrupted victim. Astronomers expect that galaxies grow by swallowing smaller galaxies. But the evidence is usually not easy to see — just as the remains of the water thrown from a glass into a pond will quickly merge with the pond water, the stars in the infalling galaxy merge in with the very similar stars of the bigger galaxy leaving no trace. But now a team of astronomers led by PhD student Alessia Longobardi at the Max-Planck-Institut für extraterrestrische Physik, Garching, Germany has applied a clever observational trick to clearly show that the nearby giant elliptical galaxy Messier 87 merged with a smaller spiral galaxy in the last billion years. "This result shows directly that large, luminous structures in the Universe are still growing in a substantial way — galaxies are not finished yet!" says Alessia Longobardi. "A large sector of Messier 87's outer halo now appears twice as bright as it would if the collision had not taken place." Messier 87 lies at the centre of the Virgo Cluster of galaxies. It is a vast ball of stars with a total mass more than a million million times that of the Sun, lying about 50 million light-years away. Rather than try to look at all the stars in Messier 87 — there are literally billions and they are too faint and numerous be studied individually — the team looked at planetary nebulae, the glowing shells around ageing stars. Because these objects shine very brightly in a specific hue of aquamarine green, they can be distinguished from the surrounding stars. Careful observation of the light from the nebulae using a powerful spectrograph can also reveal their motions. Planetary nebulae form as Sun-like stars reach the ends of their lives, and they emit a large fraction of their energy in just a few spectral lines, the brightest of which is in the green part of the spectrum. Because of this, they are the only single stars whose motions can be measured at Messier 87's distance of 50 million light-years from Earth. They behave like beacons of green light and as such they tell us where they are and at what velocity they are traveling. These planetary nebulae are still very faint and need the full power of the Very Large Telescope to study them: the light emitted by a typical planetary nebula in the halo of the Messier 87 galaxy is equivalent to two 60-watt light bulbs on Venus as seen from Earth. The motions of the planetary nebulae along the line of sight towards or away from Earth lead to shifts in the spectral lines, as a result of the Doppler effect. These shifts can be measured accurately using a sensitive spectrograph and the velocity of the nebulae deduced. Just as the water from a glass is not visible once thrown into the pond — but may have caused ripples and other disturbances that can be seen if there are particles of mud in the water — the motions of the planetary nebulae, measured using the FLAMES spectrograph on the Very Large Telescope, provide clues to the past merger. The team also looked very carefully at the light distribution in the outer parts of Messier 87 and found evidence of extra light coming from the stars in the galaxy that had been pulled in and disrupted. These observations have also shown that the disrupted galaxy has added younger, bluer stars to Messier 87, and so it was probably a star-forming spiral galaxy before its merger. "It is very exciting to be able to identify stars that have been scattered around hundreds of thousands of light-years in the halo of this galaxy — but still to be able to see from their velocities that they belong to a common structure. The green planetary nebulae are the needles in a haystack of golden stars. But these rare needles hold the clues to what happened to the stars," concludes co-author Magda Arnaboldi (ESO, Garching, Germany). Dark-Matter 'Superhighways' of the Cosmos –"Connecting Vast Bubbles Devoid of Galaxies"
NASA: "We've Only Scratched the Surface of Our Pluto Exploration"